Meyhem Lauren is Queens rap royalty, throwing down 24k bars on stage (and screen) with Action Bronson all while dropping respected underground solo releases of his own. 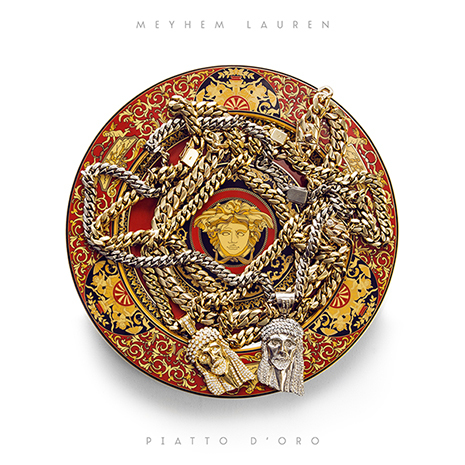 Piatto D’Oro is his most majestic work to date, a free album on Fool’s Gold featuring speaker-knocking singles “Money In My Pocket” and “Badmon Ting” alongside 13 other high-octane tales of fine silks, lobster dinners, and wilding the f**k out as only Laurenevitch can. With everyone from Alchemist and Harry Fraud to Large Professor and DJ Muggs on headnod duties, Piatto D’Oro is a must-listen… Mey and Fool’s Gold have teamed up to tuck your whole summer in. Sleeve by NB & Josh Wehle.